Journal of Nanjing Agricultural University, 2019, 42(2): 270-275. 张松, 鲍海波, 张建华, 等. 亚致死剂量噻虫嗪对日本弓背蚁觅食和亲系识别能力的影响[J]. 南京农业大学学报, 2019, 42(2): 270-275. Abstract: [Objectives] The sublethal effects of thiamethoxam, a neonicotinoid insecticide, were evaluated on the foraging and discrimination behaviors of the ant Camponotus japonicus, with special attention on the indirect effects through individual communication among ants. 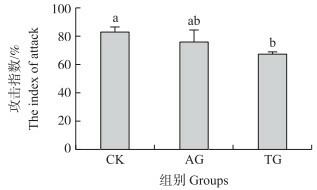 [Methods] By simulating the foraging situation, the change of foraging ability of ant in different treated groups was observed. Through the Y-tube test and EAG(electroantennography) test, the ability of different treated groups of ants to the nestmates and non-nestmates was observed. Based on the changes in the discrimination ability, the ability of different treatment groups of ants to discriminate the heterologous ants was observed in the aggressive behavior test. [Results] There was no significant difference in the ability of different treated ants to find food, but there was a difference in foraging efficiency. 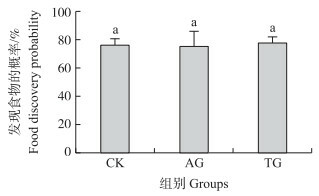 The control ants performed recruiting behavior, while the indirectly treated ants and the directly treated ants did not. The control ants showed difference to indirectly treated ants and directly treated ants in discriminating the nestmates and non-nestmate, the control ants could discriminate the non-mates well, but the others couldn't discriminate the non-nestmates well. When discriminating the nestmates, there was no significant difference among different treated ants. In the attack tests, the direct treatment with sublethal thiamethoxam remarkably reduced the aggressive behavior when compared to the control ants. However, the aggressive behavior of indirectly treated ants showed no significant differences from control and directly treated ants. [Conclusions] The sublethal thiamethoxam can directly affect the foraging and discrimination ability of the ants. Through the communications between the ants, the directly treated ants can deliver these negative effects to others which have not been directly exposed to insecticides. The treated ants affect the development of colony of the ants. 图 1 不同处理组蚂蚁发现食物的概率(x±SE, n=90) Fig. 1 The food discovery probability of the different groups CK:对照; AG:间接影响组; TG:处理组。小写字母代表在0.05水平差异显著。下同。 CK:Control; AG:Affected group; TG:Treated group. The significant differences were marked by lowercase at 0.05 level. The same as follows. 图 3 噻虫嗪处理蚂蚁选择同巢或者异巢的概率(x±SE, n=90) Fig. 3 The probability of selecting nestmates or non-nestmates in Y-tube olfactometer after thiamethoxam treatment A.一端放置同巢蚂蚁, 另一端为空白对照; B.一端放置异巢蚂蚁, 另一端为空白对照; C.一端放置同巢蚂蚁, 另一端放置异巢蚂蚁。 A. One arm was with nestmate workers, and the other arm was blank; B. One arm was with non-nestmate workers and the other was blank; C. One arm was with nestmate workers, and the other arm was with non-nestmate workers. 图 4 不同处理组蚂蚁对表皮碳水化合物提取物的触角电位反应(x±SE, n=45) Fig. 4 The electroantennography response of workers to cuticular hydrocarbons extraction A.用异巢蚂蚁的表皮碳水化合物提取物作为刺激源; B.用同巢蚂蚁的表皮碳水化合物提取物作为刺激源。 A. Stimulated by the non-nestmate cuticular hydrocarbons extraction. B.Stimulated by the nestmate cuticular hydrocarbons extraction. Wu M C, Chang Y W, Lu K H, et al. Gene expression changes in honey bees induced by sublethal imidacloprid exposure during the larval stage[J]. Insect Biochemistry & Molecular Biology, 2017, 88: 12-20. Bouchebti S, Ferrere S, Vittori K, et al. Contact rate modulates foraging efficiency in leaf cutting ants[J]. Scientific Reports, 2015, 5: 18650.